It was hard to get myself motivated to work on KITT this week. In fact, the only night Sara and I worked on KITT was Thursday. The brushing/cleaning/POR-15 project has been long and tedious, but this back section of the underbody has been the worst part so far. It was easier this week to come up with other things to do other than work on KITT. But, a couple of phone conversations Wednesday and Thursday with Billy Gunter of Knight Designs refueled my drive to finish KITT as quickly as possible. So, this weekend I am continuing to brush and clean the rest of the underbody. I hope to start prepping the underbody for paint tomorrow. I have been working to finish brushing the underbody in preparation for POR-15. I had hoped to get it cleaned and prepped this weekend, but it is turning out to be a much bigger job than I had envisioned. Much of the underbody is at a height where I cannot reach it laying on the creeper, and yet there is not enough room to sit up either. I am therefore stuck in a perpetual crunch in order to reach it. This is proving to be a pain in my back, literally. 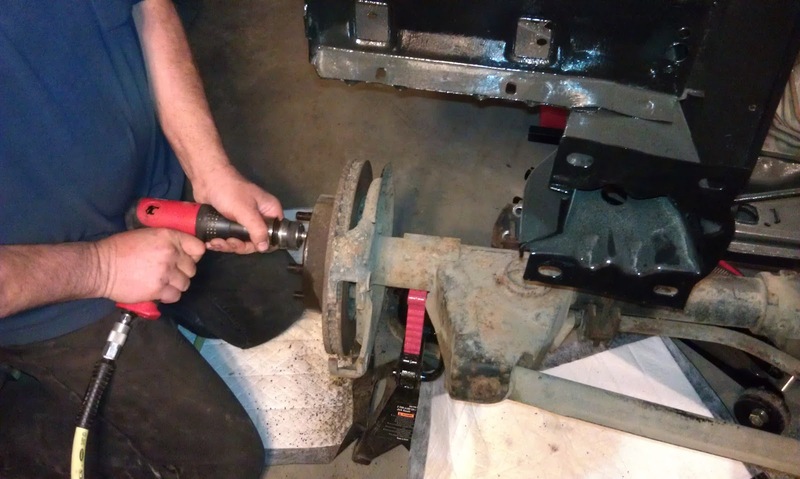 We started the weekend out by working on the the wheel wells. 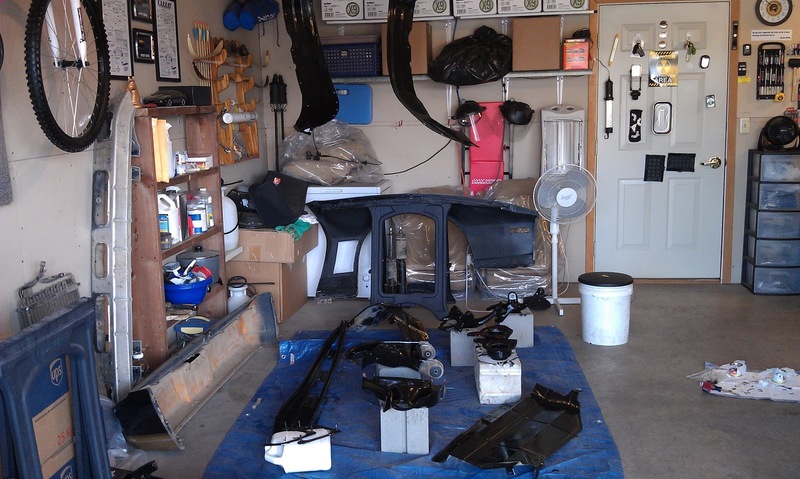 It was my intention to get both of the rear wheel wells and the underbody prepped for POR-15 by Sunday. 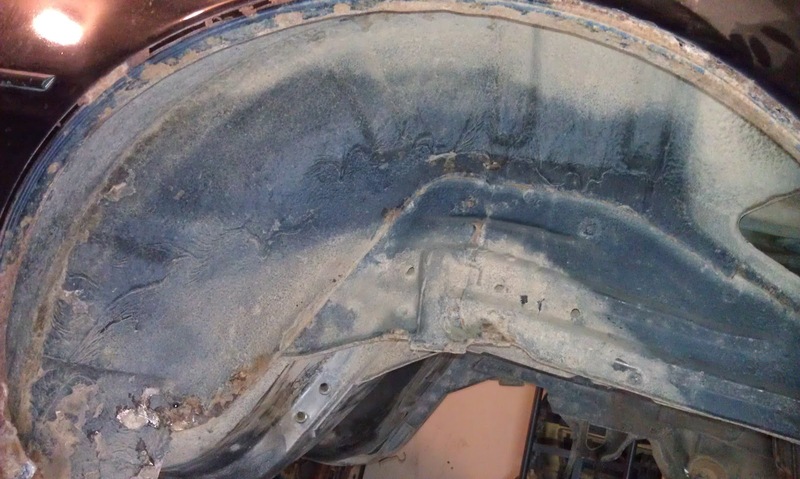 The picture below shows what the wheel well looked like when I started. I chose to try the heat gun method of softening the rubber coating and then scraping it off. This worked to an extent, but I felt it was taking longer than it took me with the front wells. I have been searching for the right person to paint KITT, and recently a co-worker recommended a local painter named Mario. He painted a couple of my co-worker's Trans Ams and did a fantastic job. I called and arranged for Mario to stop over last Friday night to take a look at KITT and size up the job. We started out by visiting about what kind of finish I wanted. I told him that I am looking for the deepest glossiest black possible. In fact it is should be such a deep gloss that it is perfectly mirror-like in its reflection almost to the point of not looking like paint. I had saved a few example pictures of paint jobs that are the caliber of what I want to achieve. 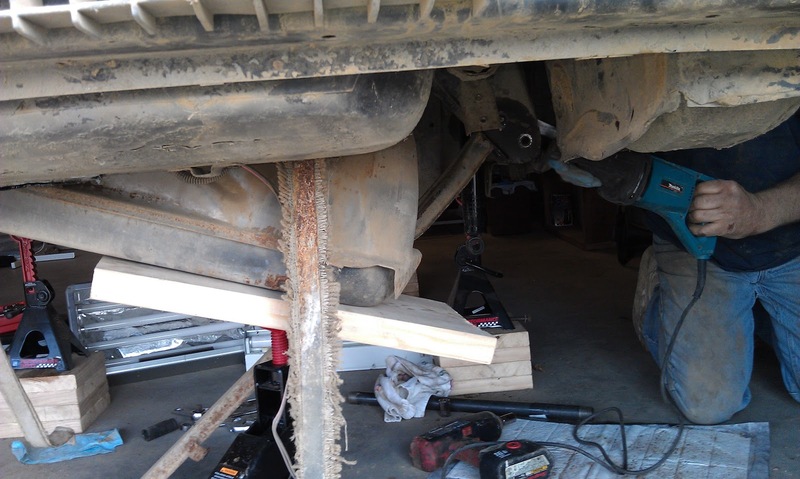 Next we spent some time on the trouble areas I was concerned about before giving the entire car a once over. If I can say one thing about Mario it is that he is very thorough. I will need to replace the driver side door. Mario pointed out areas on the door where he said there has been body work before. He said it was not worth trying to save this door. He is not a fan of reskinning doors. I will also need to get the replacement hatch (or just the hatch glass) before painting. Mario has volunteered to help me with procuring these parts. The rear fender corners that were crumpled (where the bumper mounts) will need to be hammered flat and filled flush. This is going to be a really hard area to repair because of where it is, but Mario said he can get it smoothed out. The biggest revelation was having Mario point out he believes that not only was I correct about the front end collision, but that the whole front clip was replaced. He said he can see areas that are not factory welds. He did say that whoever did the repair work did it correctly and that it should not pose any problems. The frame is straight and the car aligns just fine. I am a more than a little disturbed by this as both the CARFAX and AutoCheck reports showed no accidents and no negative titles or other problems. This really makes me wonder how accurate these reports actually are. As part of Mario's service he will take the car down to the metal, use a guide coat to find and fix all the low areas, prime, then use a two-stage process of base color then clear coat. He will also wet sand/color sand and then buff to a mirror finish. Mario will also help me with the installation of all the exterior parts and the over all fit and finish of everything. Mario wants to start on the car in March, so I now have a deadline in which I need to have KITT reassembled. A little pressure is always a good thing, right? I mentioned to Mario that I want to document the entire process on my blog, and he said I will be free to come and go at any time during the process and take pictures or shoot videos of anything I want. 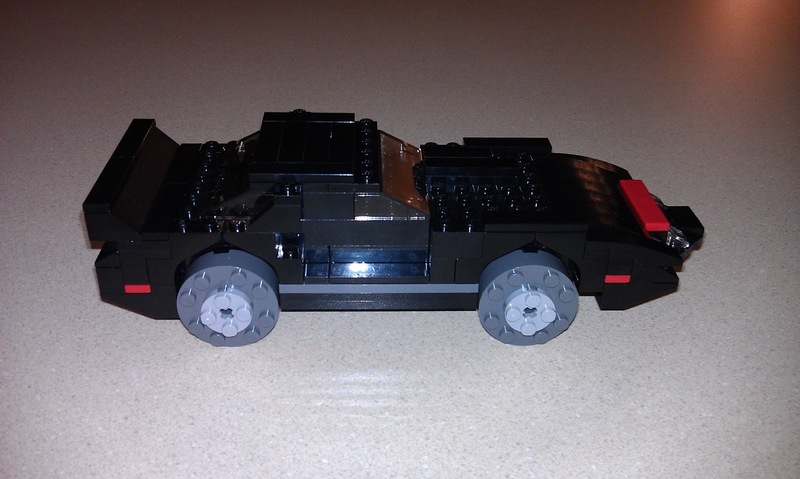 A friend of mine gave me a custom made Lego KITT! Take a look at its awesomeness! Troy stopped over Thursday night to help remove the rotors. 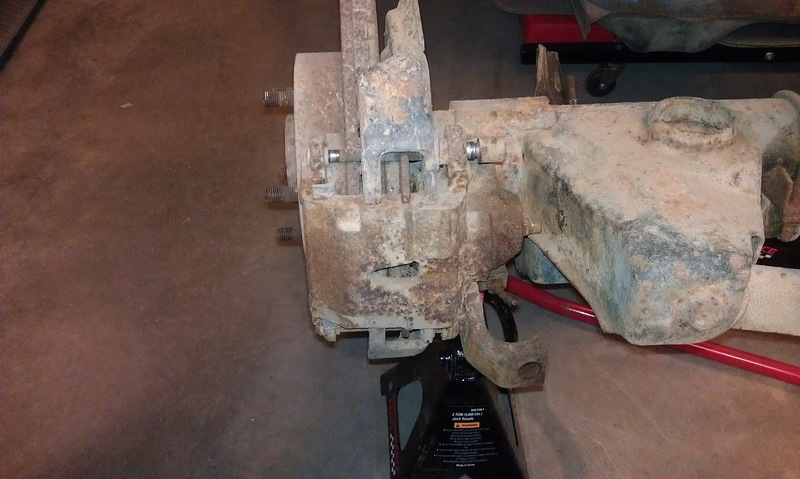 We started by using an air hammer to loosen the rust that had seized the rotors. The constant battering of the air hammer while rotating the rotor was enough to free them. 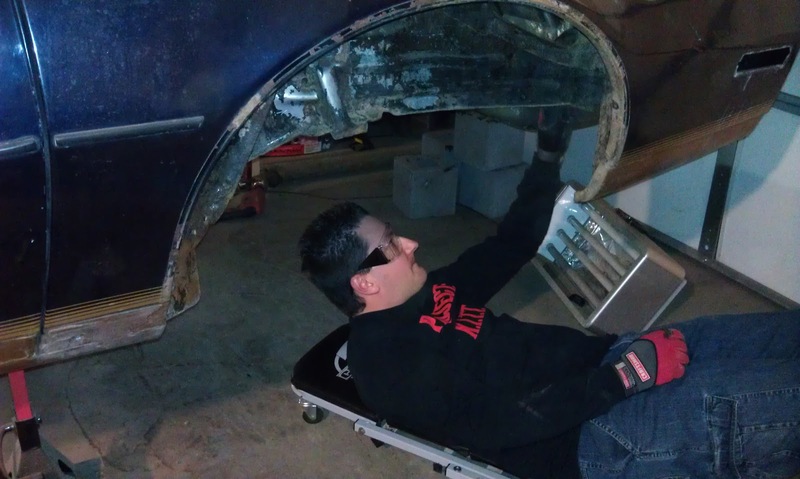 Yesterday after work I decided to work on removing the rear calipers. After much research and visiting with Troy, I discovered that the Service Manual is indeed wrong in its description the removal process. The rear calipers do not need to be compressed before they can be removed. 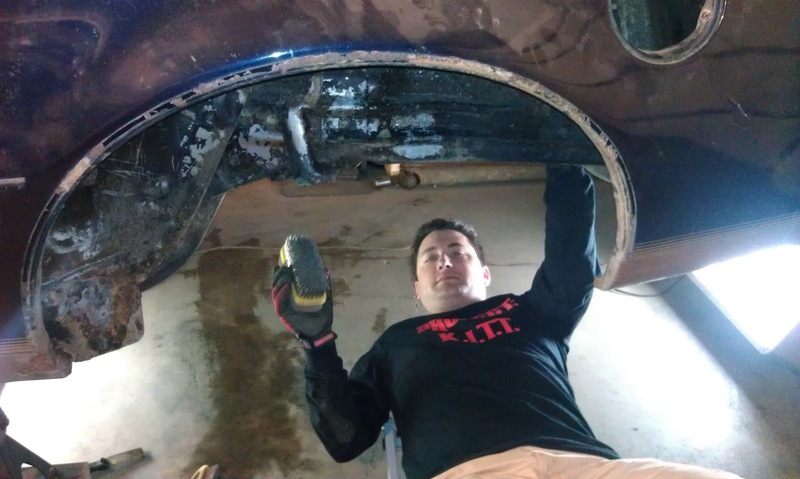 This weekend I worked on cleaning the garage and cleaning the rear underbody of the car. 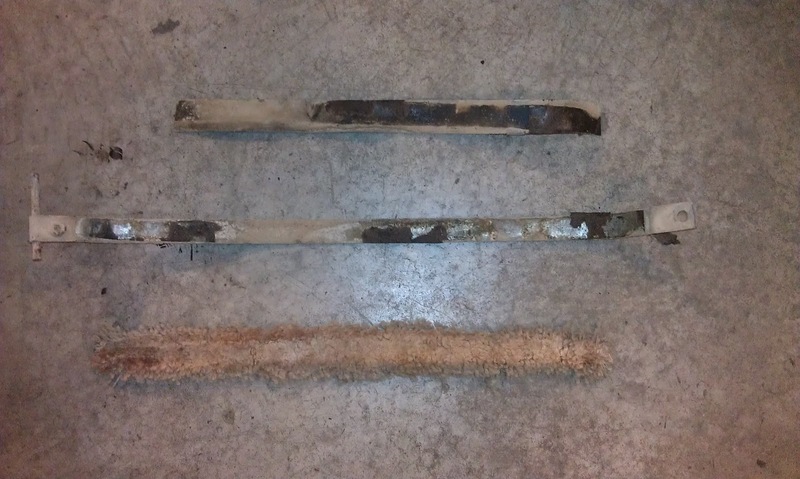 Option A: GM's original stock anti-squeak kit (which is basically thick tar paper). I would have to get this from a salvage car. Option B: Do as the previous owner of my car did and use a piece of living room carpet. I considered this, but having four strips missing out of our living room carpet might look kind of odd. Option C: An after-market anti-squeak kit, running in the neighborhood of $130. Option D: Garage Door Bottom Rubber. I read about this on ThirdGen.org. Not only is it an upgrade to the stock anti-squeak kit, but it much less expensive. It would run about $15. All things considered, I am really leaning towards the carpet. I want to thank Sara and her dad. They have both been a huge help working on KITT! Sara has been by my side throughout the whole project and I honestly could not do this without her. This project has taken and will continue to take up almost all of our free time, and she has been wonderful about that. I look forward to spending many, many years enjoying KITT and traveling with her after we are done. She is able to constantly surprise me with her talent and hard work. Thanks Sara, I love you! Sara's dad has also been instrumental in helping with the "small stuff" as he puts it. I have to say it is the "small stuff" that often takes the most time. He has saved me countless hours. Thanks Dad! Notice their Project: K.I.T.T. attire. There are always open positions on the Support Team. 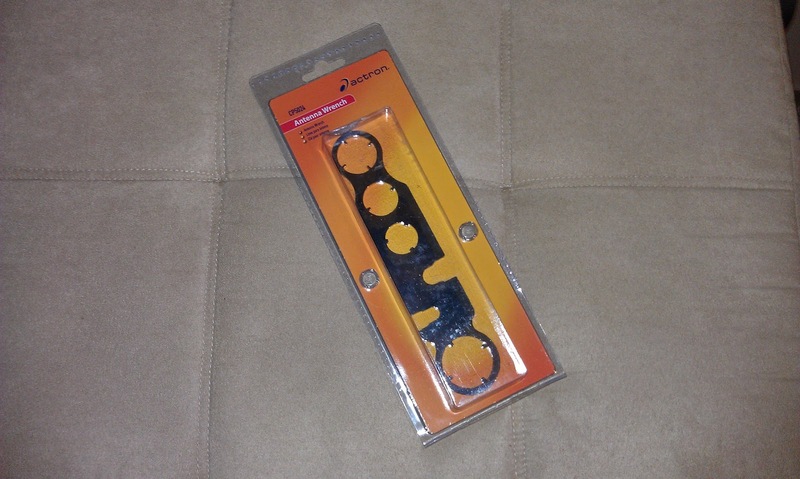 The antenna wrench I ordered arrived on Monday. Troy is back with his Sawzall! 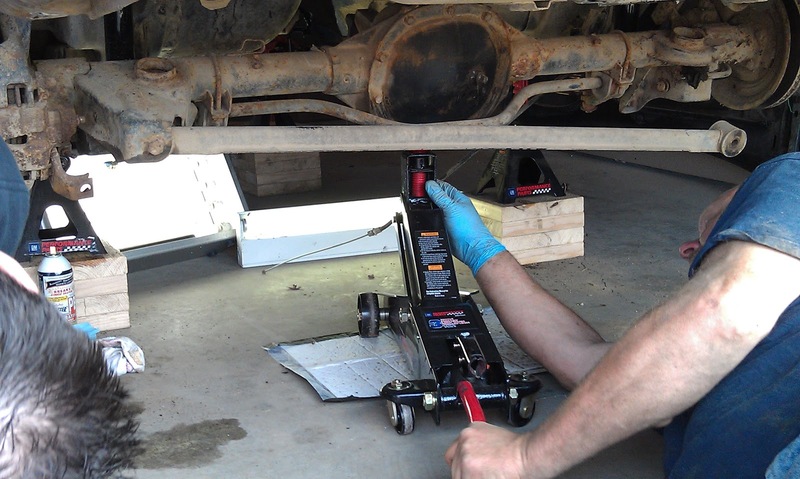 After removing the control/trailing arms, we placed the jack underneath the differential to lift it up and take the weight off the shocks. Troy called Sunday afternoon to say he could come over to help drop the rear end and gas tank. We had just finished applying the first coat of POR-15 and had parts and painting supplies spread all across the garage. We quickly picked up everything and moved it to the front part of the garage.